The stylish Clair De Lune white wicker dimple moses basket is both crisp and fresh and is the perfect place to house your new arrival. Made with top quality dark wicker with leather handles, the Clair De Lune moses basket is lightweight, easy to carry and comes complete with safety mattress, co-ordinating hood, quilt and a padded liner for increased comfort and security. 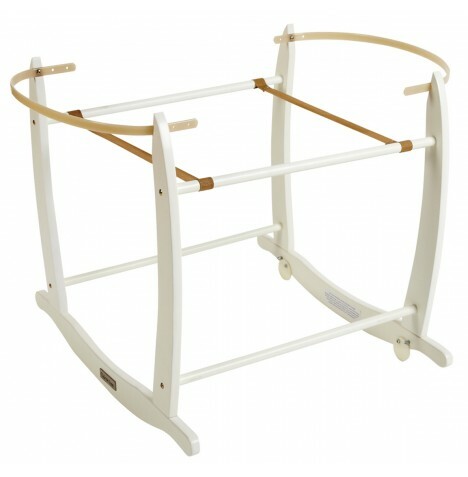 This package comes complete with a Clair De Lune deluxe wooden rocking stand which accommodates a range of mosses basket sizes and is perfect for use next to your bed during the first stages of infancy. The rocking stand has a gentle side to side rocking motion which will help baby drift off into a peaceful sleep, alternatively it can be made stationary with the “stopper” discs supplied. Very happy with item recieved,many thanks.